I've been watching gold and silver prices since many years. Being an astrologer one of the big questions had been finding an event that would reflect our modern society's relationship with these precious metals. If we could zoom in on such an event, its astrological chart would make for a powerful tool to understand and predict price development. Reading a well researched article on gold and silver's past one hundred years history it became clear that August 15, 1971 was the day when everything changed from ground up. On that day President Nixon revoked the gold exchange standard, thus setting the pretext for precious metal prices to take on a life of their own. Fiat Money was born, limitless money printing was officially legalized, it became possible to generate funds out of thin air. And sure enough, the phantom of 'paper money' started mushrooming out of control. Today's money it much like the emperor's new cloths. The emperor is naked, yet everyone is made to believe to be somewhat handicapped or retarded, not being able to see his fabulous clothes. Since times immemorial and throughout all cultures, gold and silver have been the universal currencies. On August 15, 1971, the carpet was pulled; the stage was set for a massive inflation to start developing. Within less than three years of revoking the gold exchange standard, the dollar devalued over 500% against gold. To no surprise governments and banks got very scared. Determined to break gold's back, from 1974 to 1976 gold prices were brought down by almost 50%, from $197.50 to $103.00. 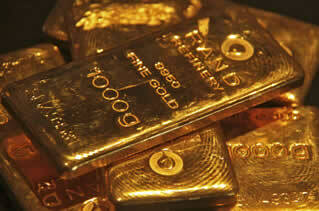 Since then, over and again, for some periods governments and banks have been succeeding derailing gold's uptrend. However, each time a point arrives when banks and governments' efforts run out of steam. A brick wall is hit and it becomes impossible to bring prices down any lower. From 1971 into 1974, gold had soared from $35 to $200. Forced down to a low point of $103 in August 1976 gold soared for 800% into 1980, reaching $850 per ounce. And then, through the eighties and nineties the gold price was brought down again. Helped by the particular macro-economic environment of these decades (high interest rates and strong economic expansion), precious metal prices retreated for almost two decades. By 1999, at $250 an ounce, the low point was reached. From then on, for the twelve years, into September 2011, gold prices took off once again, shooting up almost 800%, to reach a maximum of $1921.50 on September 6, 2011. For the past 38 months, in a concerted effort, once again banks and governments have been trying hard to break gold's back. However, despite massive selling of gold futures contracts, this 3-year bear market brought gold prices down not much more than 40%! Studying the present economical situation (links at botttom of the page) we can see the perfect setup for a strong market reversal to begin setting in right now. I've been back testing the August 15, 1971 chart. It stands out that big price movements happen synchronous with outstanding planetary transits. Depending on the nature of these planetary influences one can predict the public's changing appeal for gold. Looking at present transits it is absolutely clear that this latest attempt of capping gold's value already has has lost its momentum. Transiting Jupiter's strong influence signals a complete turn around of sentiment, bringing an abrupt and explosive end to this 38-month price retreat. What's happening is that Jupiter by transit is approaching the degree of the August 1971 Sun, at 22° 24' Leo. Approaching its yearly maximum Jupiter is steadily slowing down, remaining in this section of the zodiac for an unusual long period of time, for almost half a year! On December 8, Jupiter will turn stationary retrograde, at 22° 38' Leo, only 14' of arc away from the Sun's placement in gold's 'independence chart'! 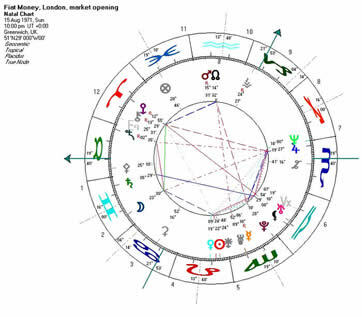 I'm sure, every astrologer will agree with me that transiting Jupiter generates a boost of optimism and expansion when pulling up to an individual's birth Sun. So, how much more special can it get when Jupiter not only transits over the Sun but makes its station right in that degree, extending its bountiful influence from a few days to half a year! For two-and-a-half months; from November 1, 2014, 'til January 15, 2015, transiting Jupiter will be within a two-degree orb; and for 8 weeks, from November 11, 'til January 6, the royal planet is within just ONE degree of the Sun! The icing of the cake might be that on the 30th of November 2014, Switzerland will hold a referendum on expanding its gold holdings. When supported by a majority the Swiss National Bank (SNB) will be required to more than double its gold reserves. Over a five year period the SNB would have to purchase 1500 tons of gold. It's obvious, regardless whether this referendum will finally succeed or not, for weeks leading up to November 30, gold will be in the spotlight, getting lots of public attention. It doesn't take many investors betting on a Swiss majority to cause an increased appetite for the yellow metal. Fifteen hundred tons of gold is a huge amount, it's 5% of all governmental gold holdings. According to the latest report from the World Gold Council (August 2014), official gold holdings totaled at 31,812 tonnes. The stock market correction has arrived: Massive global volatility, central bank wizardry, geo-political instability, and people finally realizing how overvalued the market has become. I have to admit, my prediction of rising gold and silver prices was a bit premature. I didn't consider the fact that before a tsunami crashes in water is flowing out to the sea. Just now precious metal prices are undergoing a final pullback. This downward move will generate a compression from where a strong move towards new heights will develop. By the end of this week (November 7) the final turning point might be in place. My guess for the final low is around $1140 per ounce. While over the past 3+ years the precious metals have been receding, the stock markets and lately also the US dollar have been flying high. In the wake of terminating Quantitative Easing (QE) there are indications that stocks and US dollar are touching on a solid ceiling. The moment a wave culminates it is bound to start crashing down again. Many experts are warning that a financial crash could be imminent. Bob Moriarty, founder of 321gold.com says: "I'm not going to beat around the bush. I'm not saying there's a 99% chance. There's a 100% chance. The world's financial system is in such disequilibrium that it can't gradually go down. It has to crash. The term for it in physics is called entropy. When you spin a top, at first it is very smooth and regular. As it slows down, it becomes more and more unstable and eventually it simply crashes. The financial system is doing the same thing. It's becoming more and more unstable every day." (see Moriarty's article of Oct. 29, 2014). Since the 2008 Lehman collapse, the US Fed debt balance sheet has grown by staggering 500%. By pumping excessive amounts of newly printed money into the system the only thing achieved was buying time. After months of gradually reducing the amount of newly injected money, on October 30, the Fed announced that they are going to turn this money tap off. Far and few are the people who see the collapse coming. But as this highly over-leveraged system will lose its sustenance it is bound to become instable. Earlier or later the decision to no more feed this speculation bubble had to come. And it's quite obvious, shutting the monetary taps is kicking the first domino stone. The entire endeavor of floodiny markets with sheer infinite amounts of cash was a failure. Although they're not saying it, the Fed has given in, capitulated. They realized that whatever quantitative easing was offered, all it did was enlarging the speculative bubble. Officially the unemployment rate might have come down to 6%. However according to Shadow Stats, US unemployment rate is at staggering 23.1%. The whole plan of flooding markets with trillions of dollars failed. If at all, the economy is only incrementally better off than it was after the 2008 crash. Big and lasting changes happen gradually, one step at a time. Thus we can expect this coming crash to manifest in stages. Banks and governments as we know them today will cease to exist. They will wither away hand in hand, they're the two sides of the same coin. The key to a different world is communal support, neighbors helping each other, bartering and sharing. While macro economies are bound to disappear, micro economies will rise out of the ashes. This doesn't mean that something totally new will be born. Rather what's been developing below the radar for a long time suddenly will come to be the one surviving structure.